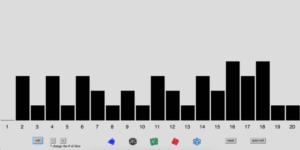 Do you see how the two 10 sided dice are on their way to create a normal distribution, wile the single 20 sided dice create a uniform distribution? This program was made possible through use of arrays and DOM elements. For this particular situation, I found the DOM elements to be a little clunky – perhaps because it is a function-oriented situation. Having to make a single button and corresponding function for each element that affected the distribution felt a little repetitive. Perhaps making a class for the two types of elements would have reduced the repetition… but I still don’t see how I could cut down on the number of corresponding functions that would have to be made. Is it generally accepted that a quick function is worth the effort, even if it only does one little thing? Is it possible to use anonymous functions here? 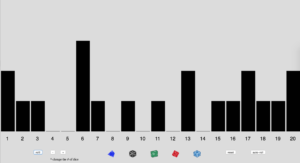 A textual indication of how many dice are currently being rolled.